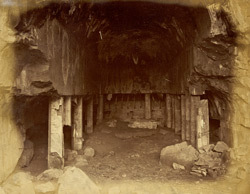 Photograph of the Buddhist chaitya hall at Pitalkhora, taken by Henry Cousens around 1880, from the Archaeological Survey of India Collections. This cave is one of a group of early Buddhist caves along the curved side of a mountain at Pithalkhora. They were excavated during the Satavahana period in the 2nd and1st centuries BC. Most of the caves are now in ruins. This view shows the large chaitya hall in Cave 3. It is divided into a nave and two aisles by octagonal pillars with no capitals and no bases. The stupa at the end of the apse has almost completely disintegrated.